* Poi - A pair of roughly arm-length chains with handles attached to one end, and bundle of wicking material on the other. * Staff - A rod of wood or metal, with wicking material applied to one or both ends. Staves are generally used in pairs or individually, though many performers are now experimenting with three or more staves. * Fire hoop - hoop with spokes and wicking material attached. * Fans - A large metal fan with one or more wicks attached to the edges. * Fire umbrella - an umbrella that has the cloth removed, with kevlar tips. * Fire meteor - A long length of chain or rope with wicks, or small bowls of liquid fuel, attached to both ends. * Nunchaku - Nunchaku with wicking material, usually at either end. * Fire stick - Like a traditional devil stick, with wicks on both ends of the central stick. * Torch - A short club or torch, with a wick on one end, and swung like Indian clubs or tossed end-over-end like juggling clubs. * Fire-knives - Short staves with blades attached to the ends and wicking material applied to the blade. 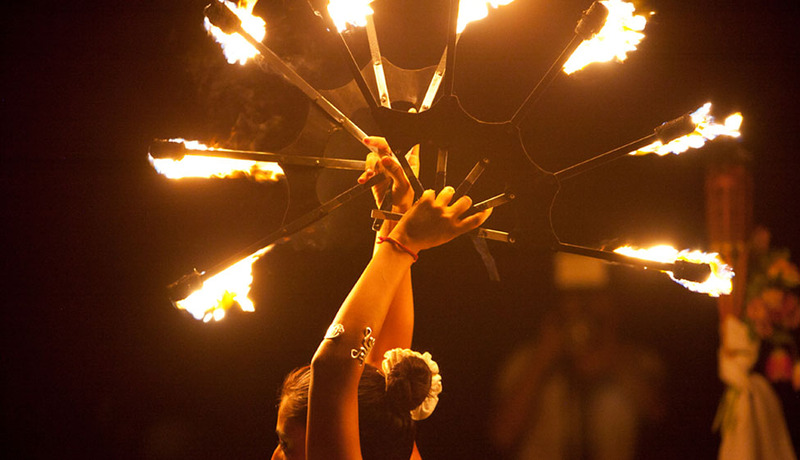 Fireknives are the traditional Polynesian fire implement and have been in use since the 1940s. * Fire rope dart - A wick, sometimes wrapped around a steel spike, at the end of a rope or chain ranging from 6–15 feet long, with a ring or other handle on the opposite end. * Fire sword - either a real sword modified for fire, or one specifically built for the purpose of fire shows. * Chi ball/Fire orb - 2 rings or handles with a wick attached between them by a thin wire. * Finger wands - Short torches attached to individual fingers. * Palm torches - Small torches with a flat base meant to be held upright in the palm of the hand. * Fire whips - Lengths of braided aramid fibre tapered to make a bullwhip, usually with a metal handle about 12 inches long. * Fire cannons - a propane flame effect device; larger ones can shoot a pillar of fire up to 200+ feet in the air, although they usually are mounted to a base or vehicle. * Fire poofers - Similar to fire cannons, but much smaller and made to be held, with fuel stored in a "backpack" fashioned of one or more propane tanks. * Fire Balls - Specially constructed juggling balls, either solid balls dipped in fuel and juggled with protective gloves, or ones designed to contain the flame in the centre of the ball. The variety of available tools took a sharp swing upwards in 2000, and as the numbers of dedicated fire tool makers increased, many makers added their own ingenuity to the art and expand the performance potential even more. Frequently, new tools appear from home tinkering and enter the public domain after a few performances.